BALDWIN PARK >> A woman found dead inside a Baldwin Park motel Friday afternoon with trauma to her “upper body,” and detectives detained a man found at the scene for questioning, authorities said. The woman’s body was first discovered about 2 p.m. inside a room at a motel in the 13900 block of Francisquito Avenue, Deputy Ryan Rouzan of the Los Angeles County sheriff’s Information Bureau said. It remained unclear Friday evening how she died. “Baldwin Park Police Department personnel responded to the location regarding a ‘keep the peace’ call,’ Deputy Ryan Rouzan said in a written statement. Paramedics pronounced the woman dead at the scene. A man who was found at the scene was “detained, pending an interview with detectives,” Rouzan said. BALDWIN PARK >> A Baldwin Park man received a prison sentence of 16 years to life Friday for stabbing another man to death during a fight in late last year, authorities said. Steven Barron, 55, pleaded “no contest” to a count of second-degree murder for the Dec. 9, 2016, slaying of 43-year-old Gilbert Ochoa of Baldwin Park, according to Los Angeles County District attorney’s officials. He also admitted the special allegation that he used a knife in the crime during Friday’s appearance in the Pomona branch of Los Angeles County Superior Court. The fatal confrontation unfolded shortly after midnight in a residential garage in the 4000 block of Harland Avenue. Barron, who was renting a room at the home, became involved in an argument with Ochoa as Ochoa was having a conversation with Barron’s landlord, Deputy Guillermina Saldana of the sheriff’s Information Bureau said at the time. Ochoa lived nearby. “The fight led to a number of physical confrontations started by Barron,” district attorney’s office spokeswoman Sarah Ardalani said in a written statement. “During one of the confrontations, Barron armed himself with a knife and Ochoa armed himself with an aluminum pole,”she said. Barron suffered a broken arm during the fight, officials said. He stabbed Ochoa in the chest with a large kitchen knife, sheriff’s officials said. “Barron gained control of the pole and hit the victim over the head,” Ardalani said. Police detained Barron for questioning and ultimately arrested him on suspicion of murder several hours later. Friday’s sentencing was the result of a negotiated plea arrangement, Ardalani said. If he had been convicted at trial of first-degree murder, Barron could have faced up to 26 years to life in state prison. BALDWIN PARK >> Young drivers and their parents are invited to take part in a free driving safety class hosted by the California Highway Patrol on next week. 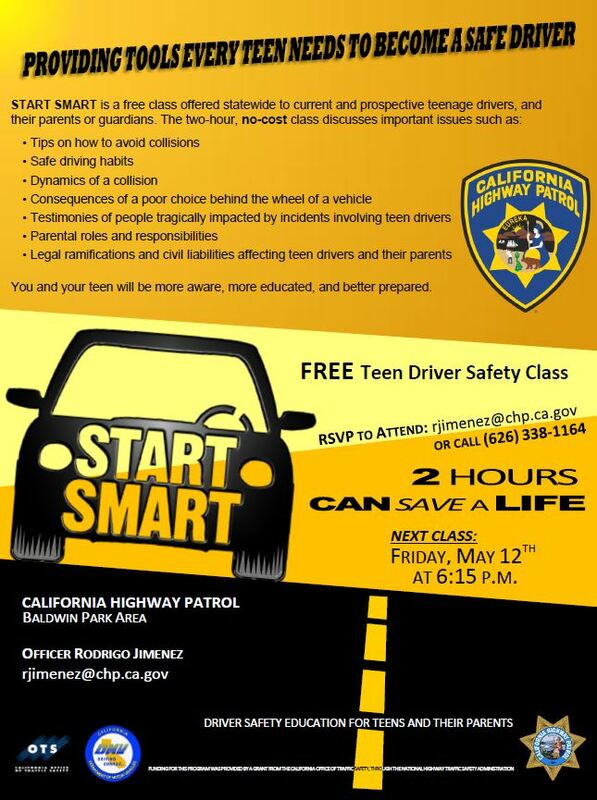 The Start Smart class will be held from 6:15 p.m. to 8:30 p.m. on Friday at the CHP’s Baldwin Park area office, 14039 Francisquito Ave., CHP Officer Rodrigo Jimenez said. The class focuses on illustrating how bad decisions behind the wheels of a car can impact lives. It’s intended for new or soon-to-be drivers between 15 and 19 years old. Video and photos will be shown to illustrate the tragic consequences of poor decisions behind the wheel of a car. Parents or guardians must attend with students. Collision avoidance techniques, the importance of wearing a seat belt, speeding and avoiding DUI are among topics to be discussed. Space is limited, and those interested are urged to RSVP as soon as possible to reserve a spot by contacting Officer Jimenez at 626-338-1164, or via email at rjimenez@chp.ca.gov. Coroner’s officials have identified a La Puente man who was fatally struck by a car on the 605 Freeway in Irwindale minutes after allegedly trying to carjack a driver in El Monte on Tuesday. Louis Marcus Martinez, 27, died after he was struck by a car about 10:10 p.m. in the southbound lanes of the 605 Freeway, just north of Ramona Boulevard, Los Angeles County Department of Medical Examiner-Coroner Chief of Operations Brian Elias said. An autopsy was yet to be completed. The bizarre series of events began about 9:45 p.m. when El Monte police received a report of an attempted carjacking in the 4000 block of Gilman Road, according to El Monte police Lt. Pete Rasic. A woman was entering her car when a man, later identified as Martinez, tried to force his way into her vehicle and grab her keys, police said. The woman managed to push the would-be carjacker away, lock her car doors and drive away, Rasic said. The suspect left behind personal items including a photo ID. Police received a second report of the same man grabbing onto a van and hanging onto to briefly it as it drove away in the area of Gilman Road and Ramona Boulevard in El Monte, officials said. The man was not found, but turned up minutes later, walking in traffic lanes of the 605 Freeway along the border between Baldwin Park and Irwindale. A car traveling about 70 mph in the No. 2 lane struck Martinez, who was pronounced dead at the scene, according to California Highway Patrol Officer Rodrigo Jimenez. He was soon linked to the prior attempted carjacking in El Monte. It was unclear why Martinez ended up walking on the freeway. BALDWIN PARK >> A 75-year-old woman died after she was struck by car while crossing a street in Baldwin Park late Wednesday, officials said. Ela Hernandez of Baldwin Park died after she was struck by a vehicle about 6:35 p.m. while crossing Francisquito Avenue at Athol Street, Los Angeles County Department of Medical Examiner-Coroner Chief of Operations Brian Elias said. She was walking within a crosswalk when struck, Baldwin Park police Sgt. Joshua Hendricks said. Paramedics pronounced Hernandez dead at the scene. The driver of the vehicle remained at the scene and cooperated with police, the sergeant said. The investigation was ongoing, however there were no initial signs of intoxicated driving. Further details, such as the directions of travel involved in the collision, were not available Thursday. Police are asking the public’s help in finding a West Covina man suffering from dementia who went missing in after leaving a hospital in Baldwin Park on Saturday morning. 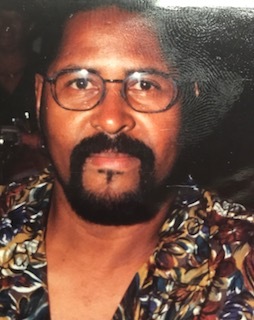 Jerry Quinton Williams, 73, was last seen at the Kaiser Permanente Baldwin Park Medical Center, 1011 Baldwin Park Blvd., during the early-morning hours, West Covina police officials said in a written statement. He hasn’t been seen or heard from since. “(Williams) suffers from early stages of dementia and needs ongoing medical attention,” according to the statement. Williams was driving a Chevrolet Colorado pickup truck with a license plate of 84733X1. He’s described as black, 6 feet 3 inches tall, 210 pounds, with a goatee and piercing in his left ear. He was last seen wearing red and black gym shorts. Anyone who spots the missing person is urged to call 911 or contact local police immediately. BALDWIN PARK >> Young drivers and their parents are once again invited to join in a free driving safety class hosted by the California Highway Patrol this Friday. 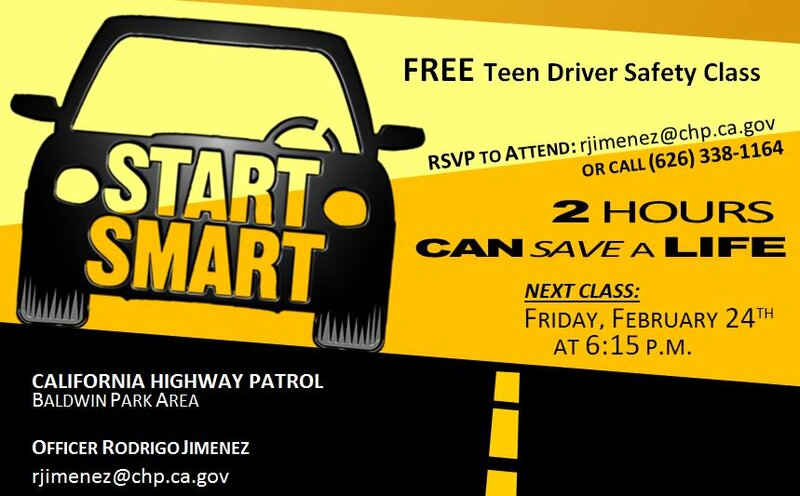 The Start Smart class will be held from 6:15 p.m. to 8:30 p.m. at the CHP’s Baldwin Park area office, 14039 Francisquito Ave., according to CHP Officer Rodrigo Jimenez. “The primary objective of this program is to provide teens between the ages of 15 and 19 with an interactive safe driving awareness class to illustrate how poor choices behind the wheel can tragically impact many lives,” the officer said. Video and photos will be shown to illustrate the tragic consequences of poor decision behind the wheel of a car. Parents or guardians must attend with students. BALDWIN PARK >> Police arrested a man at a Baldwin Park in-home day care center on suspicion of child molestation on Sunday, authorities said. Few details were initially released as detectives continued gathering information and seeking possible additional victims, Baldwin Parkp police Sgt. David Leon said. Detectives arrested the suspect Sunday morning at his home, which also operated as a day care center, in the 4200 block of Benham Avenue, the sergeant said. His identity was not released Sunday afternoon due to the active investigation. It was not clear if the suspect worked or operated the in-home day care center, or merely lived there. Investigators also served a search warrant at the home and recovered items of evidence, he said. Anyone with information is urged to contact Baldwin Park police Detective Carmen Chice at 626-960-1955, ext. 439. BALDWIN PARK >> As part of its ongoing efforts to keep young drivers and the motoring public at-large safe behind the wheel, the California Highway Patrol is hosting a free safe driving class for teens and their parents on Friday, officials said. 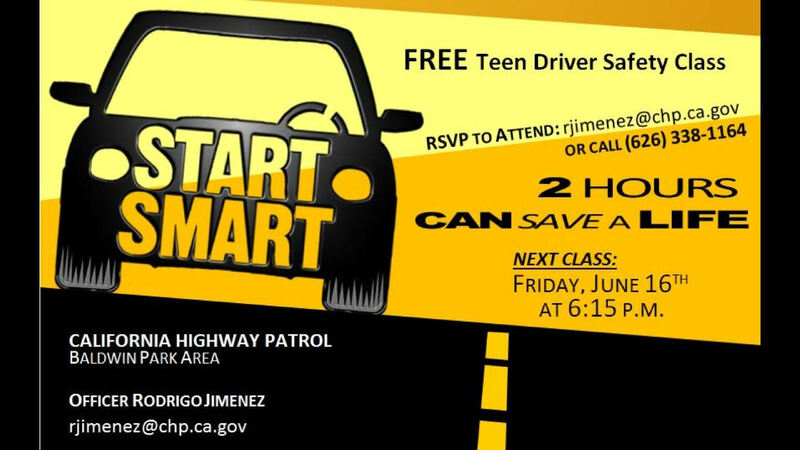 Both new and soon-to-be drivers are invited to take part in thetwo-hour “Start Smart Class,” which will be held at 6:16 p.m. Friday at the CHP’s Baldwin Park-area office, 14039 Francisquito Ave., CHP Officer Rodrigo Jimenez said. The class focuses on safe habits, responsible decisions and collision avoidance. Photos and pictures depicting the results of bad decisions behind the wheel will be displayed, and teens must be accompanied by a parent or guardian. A driver’s license is not required to participate. To reserve a space, or for more information, Officer Jimenez can be reached at 626-338-1164, or via email at rjimenes@chp.ca.gov. BALDWIN PARK >> Police and California Highway Patrol officer jailed an auto theft suspect who led them on a pursuit from El Monte before crashing into a CHP cruiser in Baldwin Park while fleeing in the wrong direction of traffic on the 10 Freeway, authorities said. The suspect was found and taken into custody nearby, and no officers were hurt in the incident, which began shortly before 9 p.m. in El Monte, California Highway Patrol Officer Tony Polizzi said. Authorities briefly shut down the westbound lanes of the 10 Freeway following the collision, but quickly reopened them. A LoJack vehicle anti-theft signal first attracted the attention of El Monte police to the vehicle, officials said. The driver failed to pull over for police, initiating a chase that reached high speeds and travelled on the wrong side of the roadway more than once. The CHP took over the pursuit as the driver made his way onto the 60 Freeway. Shortly after he began heading east in the westbound lanes of the freeway, he collided with a CHP cruiser near Baldwin Park Boulevard, Polizzi said. It was not immediately clear whether the CHP officer crashed into the suspect intentionally or unintentionally. The driver got out of the crashed car and continued to flee on foot, but was soon captured in a nearby neighborhood, officials said. CHP officials could not confirm initial radio reports from the scene that a gun was recovered from inside the suspect’s stolen car. No further details were available late Wednesday.